Activists protest at the base of the Edward Cornwallis statue after city staff covered it with a black sheet in Cornwallis Park in Halifax on Saturday, July 15, 2017. 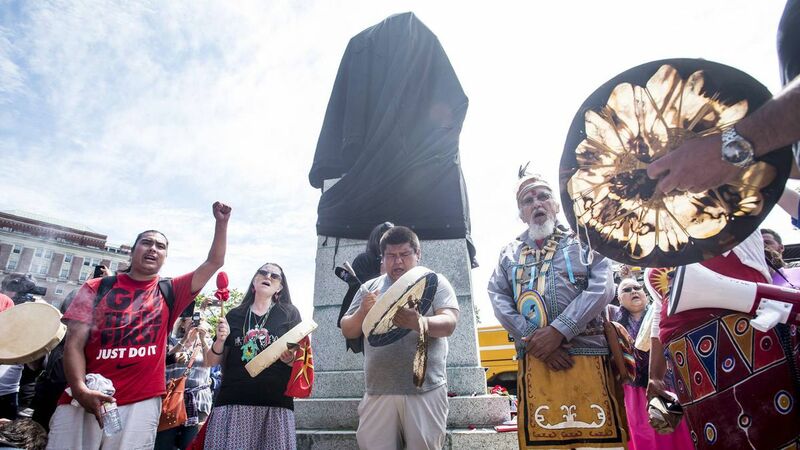 The Armed Forces says the investigation has concluded into the Canada Day incident in which a group of military members identifying themselves as "Proud Boys" disrupted an Indigenous ceremony in Halifax. Lt.-Cmdr. Jordan Holder of Maritime Forces Atlantic told Global News the "results are being reviewed by the chain of command." The investigation began in early July, a few days after a group of "Proud Boys" confronted Indigenous people gathered in a park for what they described as a sacred rite. The Armed Forces confirmed five members of the military were involved, and apologized for their actions. Administrative action was initiated, and the men have since been placed on paid leave. Rear Admiral John Newton had also said the Canadian Forces National Investigation Service was investigating. The "Proud Boys" – known for matching black polo shirts often worn by members – was founded in the U.S. by Gavin McInnes, a Canadian who helped establish Vice Media and is now an outspoken, right-wing political pundit. The "Proud Boys" call themselves "Western chauvinists." Late last month, a group of customers, some of whom identified themselves as being affiliated with the "Proud Boys," was asked to leave Timber Lounge Halifaxe, a Halifax axe-throwing venue. Timber owner Marc Chisholm said the group's money was refunded. "We have Native members on staff and they just didn't feel right coaching them and didn't feel safe coaching them so I made the decision and backed up my staff," Chisholm said. "Based on their present actions, we didn't feel that it was safe for our staff or other patrons – there was another group throwing as well – so we just refunded their money and asked them to leave."